Lake Toba in North Sumatra today is a calm 100-kilometre stretch of water, flanked by green hills and rocky outcrops. But a mere 74,000 years ago, the region couldn’t have been more different: the supervolcano that forms the lake’s bowl blasted up to 5,300 square kilometres of hot rock and dust into the atmosphere and surface, leading to a volcanic winter which dropped global temperatures by 3 to 5 ºC for the best part of a decade. There’s no doubt these supereruptions are capable of widespread destruction. Some scientists believe the “Toba catastrophe” killed off most humans. And Toba today is one of many supervolcanoes scattered across the globe. To better understand why supervolcanoes erupt majestically then sit quiet for hundreds of thousands of years, rather than burble along at a moderate rate, a team from Egypt, France, Russia and Saudi Arabia delved into Toba’s plumbing and found it’s fed by a massive magma reservoir that gradually builds up over millennia before exploding. Russian Academy of Sciences Ivan Koulakov and colleagues examined how waves from earthquakes shook the region in 1995 and 2008. In particular, they looked at P-waves – which can course through liquid as well as rock and are the first waves of an earthquake to show up on a seismograph – and S-waves, which can only move through solids. From these they determined the complex, multi-level structure of the Earth 150 kilometres beneath the Toba caldera and movements of rock and volatiles such as water. The “magma factory” starts with the Indo-Australian plate, which is sliding underneath Indonesia at around 56 millimetres each year. It’s torn, too – one end is denser, and sinking faster, than the other end. The tear is known as the Investigator Fracture Zone and runs underneath the Toba caldera. At around 150 kilometres below the surface on the frature zone, the plate melts. Volatiles escape the rock to burble up through the mantle and fill a magma reservoir of around 50,000 square kilometres, which sits 30 to 50 kilometres below Lake Toba. The magma in the chamber is too dense to make its way any further and the overlying crust hems it in. But as more volatiles rise and join the reservoir, bringing heat with them, they cause more rocks to melt. When the molten upper crust is saturated with these volatiles, they cause what the researchers call an “avalanche-style process”. Overheated fluids turn to gases, increasing pressure in the reservoir and bam! The contents empty in a massive eruption. The process, then, begins again. It will repeat until the fracture zone is completely subducted. So is there going to be another Toba super-explosion soon? Koulakov thinks not – the next will happen in the next tens or hundreds of thousands of years. They found S-waves managed to move through the magma reservoir, signifying a large chunk of solid rock. If it was liquid, though, the next explosion would happen much sooner. If it blows again, it could make Vesuvius look like a tea party. 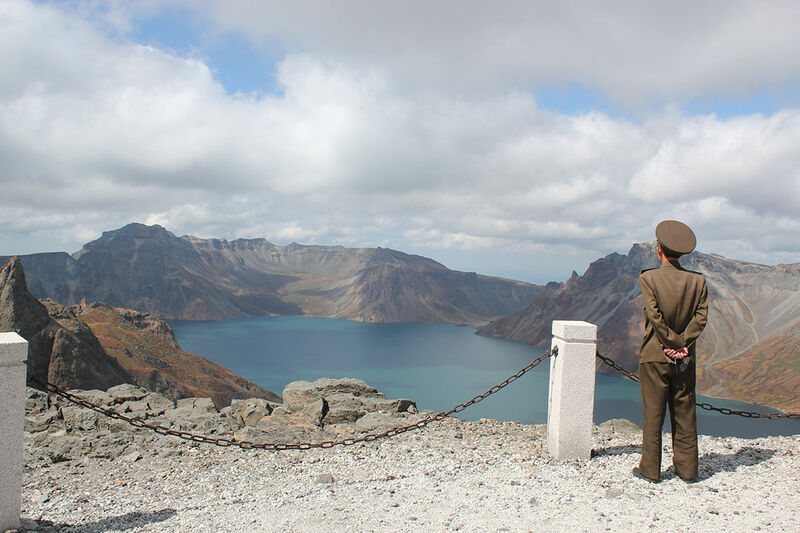 Now, in a ground-breaking collaboration between the West and North Korea, vulcanologists are gaining new insights into Mount Paektu, on North Korea’s border with China, and whether it might blow its top any time soon. If it does, the outcome could be catastrophic. Paektu’s last eruption, a thousand years ago, is the second largest ever recorded, topped only by the eruption of Mount Tambora in Indonesia in 1815. “If it erupted, it would have impacts way beyond Korea and China,” says James Hammond of Birkbeck, University of London, one of the scientists involved. In 946 AD, the eruption of Mount Paektu, Korea’s highest mountain, blasted 96 cubic kilometres of debris into the sky, 30 times more than the relatively puny 3.3 cubic kilometres that Vesuvius spewed over Pompeii in AD 79. Yet despite is size and the potential impact of an eruption, little is known about this enigmatic volcano. Western researchers got involved because the team investigating the volcano in North Korea, led by Ri Kyong-Song of the government’s Earthquake Administration in Pyongyang, needed access to extra scientific equipment and know-how. Chinese vulcanologists, who have been monitoring the volcano they call Changbaishan from their side of the border, also wanted more information from the Korean side. They and the Koreans have been monitoring the volcano closely ever since suspicious bulges were seen in and around the volcano between 2002 and 2005. These involved ground deformations measured by GPS, increased gas emissions and seismic rumbles. “It’s a priority for both countries, and both have monitoring networks on the volcano, keeping an eye on it,” says Hammond. Hammond and others from the West were invited to Korea in 2011 to install six seismometers at distances up to 60 kilometres from the volcano. These were sited to detect seismic waves from earthquakes elsewhere in the world passing through the ground beneath Paektu. Seismic waves travel at different speeds through solid and molten rock, giving the researchers crucial information about what lies beneath. The results reveal that there is indeed extensive magma beneath the volcano. “It’s a mushy mixture of molten rock and crystals that goes down right through the crust around 35 kilometres deep,” says Hammond. It’s rare to see a partially melted type of magma with such a large fluid component throughout the whole crust, he says. These are the first known estimates of the crustal structure of the volcano’s North Korea side and for anywhere beneath North Korea. The partially melted crust is a potential source for magma in past eruptions and it may be associated with the recent volcanic unrest there. At the moment, though, there’s no pool of liquid magma gathering near the surface – often a prelude to an eruption. At present, the researchers are not sure how much has to accumulate before the volcano erupts, he says. That’s why the collaboration is set to continue for some time, with Hammond due back in Pyongyang next week. “We’ll be discussing what we’ll do over the next 12 months, and longer term over the next five to 10 years,” says Hammond. After years working together, the two teams have got to know each other well, talking geology through an interpreter during the day, and in the evening heading for a restaurant or karaoke bar. “With what we’re doing, there’s no political element – we’re involved to understand a huge volcano, and the fact we’re having this dialogue is a great example of science transcending political differences,” says Hammond. “This is a bit of a first, in terms of a collaboration resulting in publication in a high-profile Western journal,” says Hammond. So next week, when he reaches Pyongyang, he and his Korean colleagues will be celebrating, probably in a karaoke bar in Pyongyang, drinking soju, the rice liquor popular in the country. Simmering deep below the geysers and hot springs of the Yellowstone caldera is a dormant supervolcano—a powerful behemoth with the ability to blanket the western U.S. with many centimeters of ash in a matter of hours. What could spark such a powerful eruption? Scientists have long debated over the origins of Yellowstone’s supervolcano, with the most widely accepted idea suggesting that it was formed by a mantle plume—a column of hot rocks emerging from deep within our planet, in the mantle layer. But a new simulation shows that the conventional wisdom was wrong. The plume could not have reached the surface because it was blocked by a slab from an ancient tectonic plate. The simulation results of the model, which is the first to replicate the complex interaction between a mantle plume and a sinking slab, was detailed* last month in Geophysical Research Letters. Lijun Liu, a geologist at the University of Illinois at Urbana–Champaign, and his graduate student Tiffany Leonard built the model to replicate both the plate tectonic history of the surface and the geophysical image of Earth’s interior. “No one had modeled it this vigorously,” says Brandon Schmandt, a geologist at the University of New Mexico who was not involved in the study. Not only did Liu and Leonard create a three-dimensional view of Yellowstone’s underbelly, they did so over the past 40 million years in an attempt to re-create the eruptions that have dotted the U.S. from Oregon to Wyoming. The slab in question was driven deep into Earth’s mantle about 100 million years ago when the Pacific and North American plates began converging. Like a canoe paddle pushing through water, the mantle flows around the sinking slab causing pressure to build toward the front. But 15 million years ago the model shows that the pressure difference became too much to bear and the slab began to tear. The plume below pulsed through the slab, leading to massive outpourings of magma, the pattern and timing of which appear consistent with the Steens–Columbia River flood basalts, which spewed out one million times more molten rock than the 1980 Mount Saint Helens eruption. But that’s where the similarities between the model and geologic surface features end. Despite the gaping hole in the center of the sunken slab, the plume did not continue to rise through it. That is because the mantle is more like honey than water—it’s highly viscous. So as the slab continued to sink, it pulled the surrounding mantle down with it, ultimately sealing the hole and blocking the plume from reaching the surface for the next 15 million years. The favored hypothesis cannot explain the string of volcanic eruptions since those first flood basalts, including the formation of Yellowstone’s caldera, which happened only 2.1 million years ago. “Ultimately, we need a new explanation for Yellowstone’s formation,” Liu says. In other words, the team needs to find an additional heat source. Leonard thinks this could come from the Juan de Fuca Ridge—a jagged volcanic seam where magma oozes up between spreading plates to create a new seafloor—in the Pacific Ocean. Although that’s almost 1,600 kilometers away from Yellowstone’s hotspot today, the ridge can easily affect the middle of the North American Plate. Because it lies just slightly west of the Cascadia subduction zone, the young seafloor is easily shoveled east beneath the North American Plate. So it is likely that some event, millions of years ago, spurred a lot of heat within the Juan de Fuca Plate, which was then shoveled underneath the North American Plate and swept along with that string of volcanic eruptions until it eventually helped form Yellowstone’s gaping caldera in the Rocky Mountains. 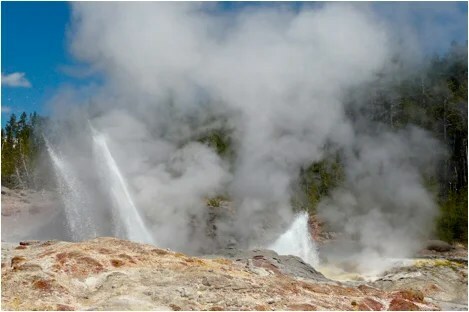 Supervolcanoes, such as the one dormant under Yellowstone National Park, may erupt when cracks form in the roofs of the chambers holding their molten rock, according to a new study. If scientists want to monitor supervolcanoes to see which ones are likely to erupt, this finding suggests they should look for telltale signs, such as earthquakes and other factors that might crack the magma chambers of these giant volcanoes. Supervolcanoes are capable of eruptions overshadowing anything in recorded human history — ones in the past could spew more than 500 times more magma and ash than Mount St. Helens did in 1980, the researchers said. These massive eruptions would also leave behind giant craters known as calderas that measure up to 60 miles (100 kilometers) wide. Twenty or so supervolcanoes exist today, including one beneath Yellowstone in the United States. Much remains unknown about what triggers supervolcano eruptions because no supervolcano has been active since the earliest human records began. Conventional volcanoes are known to erupt as molten rock flows into and pressurizes their magma chambers. However, previous research suggested this kind of trigger does not work for supervolcanoes, whose magma chambers can be dozens of miles wide and several miles thick — magma cannot fill these chambers fast enough to generate enough pressure for an eruption. Scientists recently suggested that supervolcanic eruptions occur because magma might be less dense than the rock surrounding it. This could force magma to buoy up through the ground, the way a balloon floats upward in water, potentially pressurizing magma chambers enough for eruptions. However, at supervolcano sites, “we don’t see a lot of evidence for pressurization,” Gregg said in a statement. When she and her colleagues incorporated magma buoyancy into their numerical models of supervolcanoes, they found it could not trigger eruptions. Instead, Gregg and her colleagues found the size of a supervolcano’s magma chamber is a much greater factor than magma buoyancy when it comes to eruptions. The research team’s model suggests that, if a crack in the roof penetrates the magma chamber, the magma within uses the fault or crack as a vent to shoot to the surface. This could trigger a chain reaction that “unzips” the whole supervolcano, the researchers said. These findings suggest that if supervolcano eruptions are triggered by external factors, such as faults in the roofs of their magma chambers, “then we should look at seismicity, what types of faults are being developed, what is the stability of the roof and what kinds of activities are happening on the surface that could cause faulting,” Gregg said in a statement. In the future, Gregg and her colleagues want to use supercomputers to track the evolution of supervolcano magma chambers over time in greater detail. “I am very excited to see how the research develops over the next five to 10 years,” Gregg said.